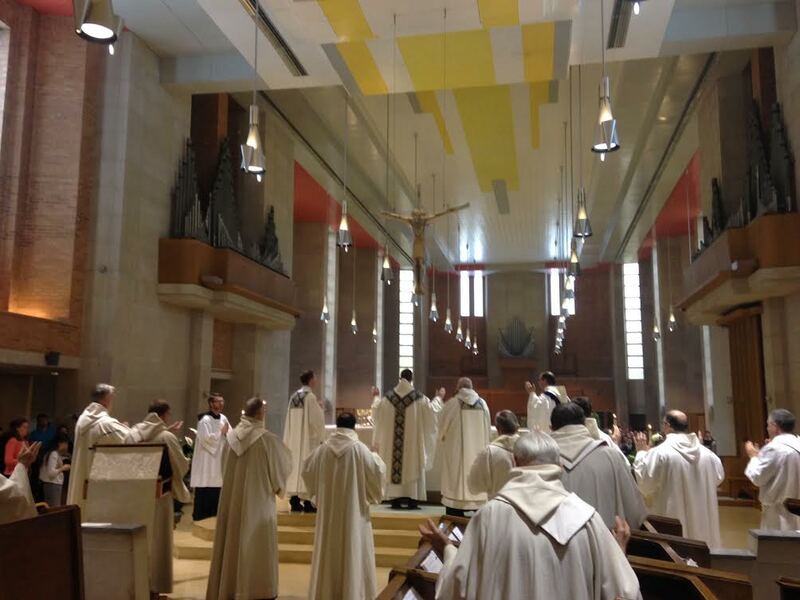 This past weekend saw the first priestly ordination of our class. Br. 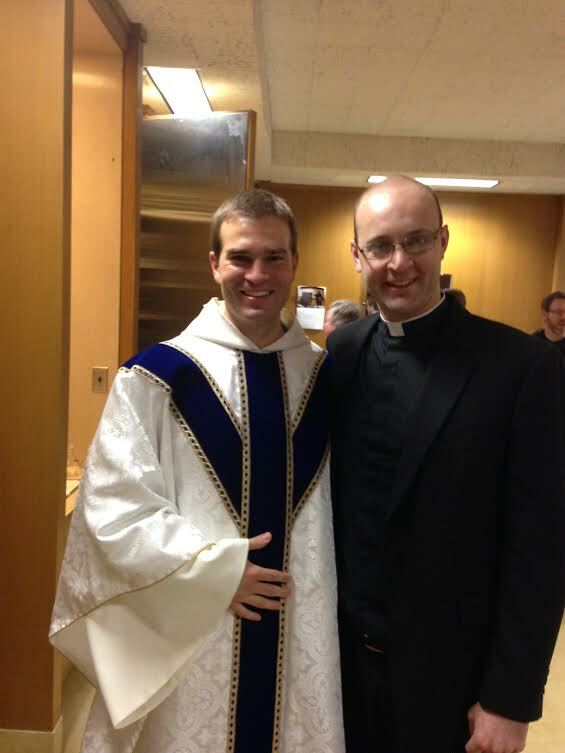 Simon Baker, OSB, of St. Benedict’s Abbey in Atchison, Kansas, became Fr. Simon Baker, OSB in the abbey church there. I am so thankful I could be there and a part of this awesome weekend, witnessing a good friend become a priest forever. It was such a grace. He will be an extraordinary priest. I want to reflect just a bit here on some of the weekend’s graces. I was captivated by the beauty of the abbey’s property the moment I set eyes upon it. The monastery operates a college by the name of Benedictine College. It is a college for happy Catholics. As I walked the campus, students would look at me and greet me, “Good morning, Father,” or, “Hi Father.” I popped into the Marian Grotto to light some candles, and several students popped in while I was there. Before Mass, all four confessionals were being used, and each had a line. On Saturday evening, as usual, there was a holy hour for vocations at 8pm. Many students were there. What an incredible campus!!! Would that all Catholic colleges had such a nice feeling. In any event, the monks were true to the Benedictine charism of hospitality. I enjoyed getting to know the monks. I discovered that one of them was baptized at my own home parish, St Charles in Bloomington. He went through RCIA there. Funnily enough, the same priest baptized him that baptized me! Go figure. 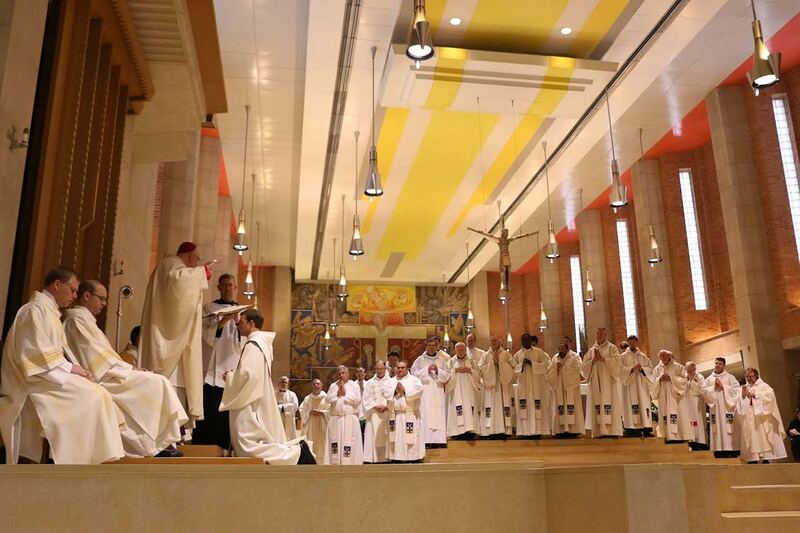 The ordination itself was simply incredible. Archbishop Joseph F. Naumann had such a compassionate, merciful presence. He is one of those men in and through whom it is easy to see Christ. He delivered the most beautiful homily. He spoke, looking directly at Br. Simon the entire time, about the current Year of Consecrated Life and the role of St. Benedict’s Abbey in general as an overflowing source of grace, but also about the individual priest monk that will be Fr. Simon. He spoke, too, about the upcoming Year of Mercy, and he said to Fr. Simon: “You will be on the frontlines of mercy!” What a powerful line. I wish I could remember the entire homily. I hope someone recorded it and posts it online. I do remember that he preached quite a bit about the Gospel, which I proclaimed, from Mark 16. Verses 17 and 18 outline the powers of the new apostles: “Using my name they will cast out demons; they will speak in new tongues; they will pick up snakes in their hands, and if they drink any deadly thing, it will not hurt them; they will lay their hands on the sick, and they will recover. '” Archbishop noted that even greater powers than enduring poison and being multi-lingual were soon to be bestowed upon Br. Simon: he would receive the power to bring Christ in the sacraments and in his person to a hungry lot of people. He would receive the power to love as Christ loved, to forgive as Christ. Fr. Simon’s First Mass was also something else. I am tired and will therefore write only about one part, the part that moved me the most. During the Eucharistic prayer, Fr. Simon was at the altar, of course, and in this church the crucifix hangs right above the altar. 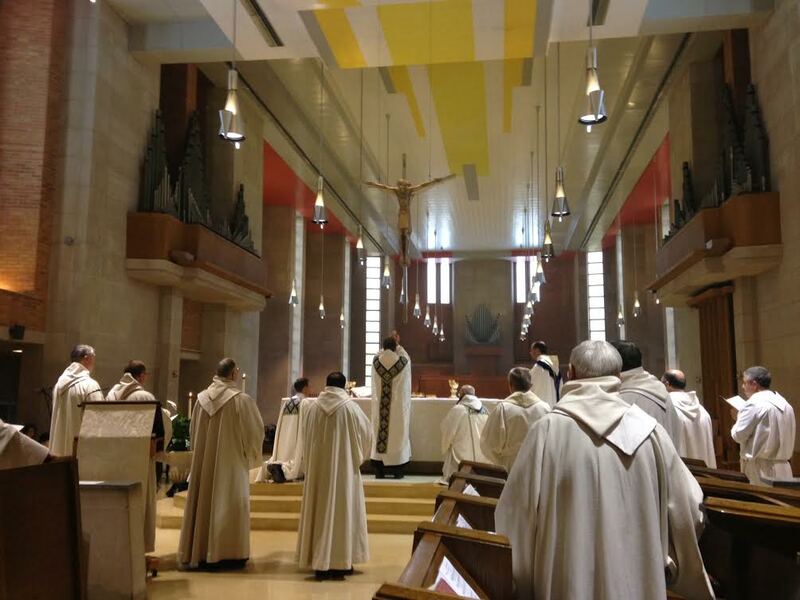 There was the new priest with his hands in the orans position, wide open, and just four feet above him was Christ in the orans position, arms wide open.Please join me in praying a prayer of thanks for Fr. 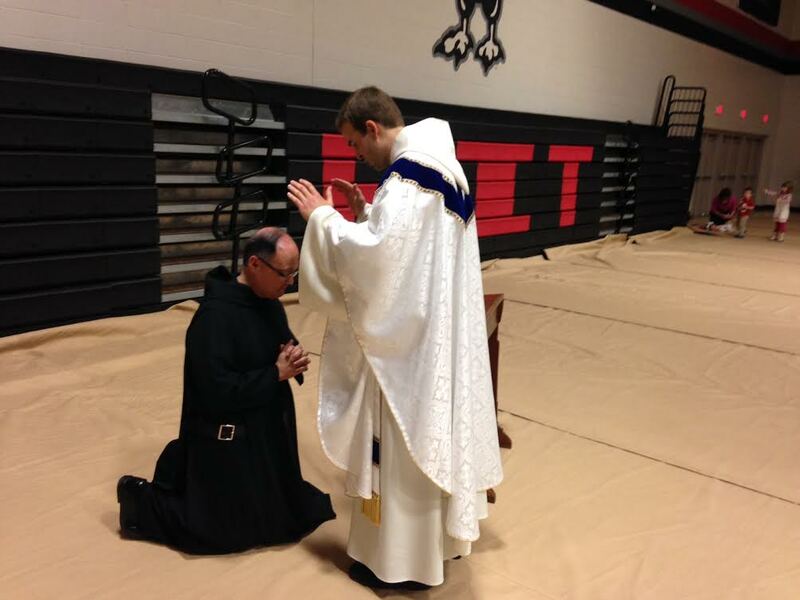 Simon and his vocation, and a prayer of petition that he might always be a good, holy priest. I believe he will. This entry was posted in Ordinations, Vocations. Bookmark the permalink.